﻿ Cocotier Du Rocher Kepulauan Seychelles. JIMAT di Agoda.com! Ada soalan mengenai Cocotier Du Rocher? Dengan lokasi mudah di Kepulauan Seychelles, Cocotier Du Rocher adalah tempat yang hebat untuk menjelajahi bandar yang menarik ini. Terletak dari keseronokan bandar, hotel 2-bintang ini terletak di lokasi yang sangat baik dan menyediakan akses kepada tarikan terbesar di bandar. Tidak kurang hebat adalah akses mudah hotel untuk ke pelbagai daya tarikan dan mercu tanda bandar, seperti Pusat Informasi Lindungan Veuve, Kelab Safari, Mason's Travel. Menawarkan tetamu hotel perkhidmatan yang unggul dan pelbagai kemudahan, Cocotier Du Rocher komited untuk memastikan penginapan anda berada di tahap seberapa selesa yang mungkin. Tetamu hotel boleh menikmati kemudahan seperti Wi-Fi di tempat awam, tempat letak kereta, khidmat bilik, penjagaan kanak-kanak, bilik keluarga. Cocotier Du Rocher mengandungi 8 bilik yang dihias indah dan menawarkan bilik larangan merokok, penyaman udara, meja, beranda/teres, kipas. Sepanjang hari anda boleh menikmati suasana yang santai dengan taman permainan kanak-kanak, taman. Cocotier Du Rocher adalah destinasi sehenti anda bagi penginapan hotel berkualiti di Kepulauan Seychelles. Perkhidmatan kereta bugi dari dan ke jeti disediakan di penginapan. Hubungi pihak penginapan untuk maklumat lanjut. The hotel room was nice with all the amenities. La Digue is a small island, so the location doesnt matter. You can get cycles on rent and pretty much cover the entire island. A wonderful stay in a calm and beautiful setting. 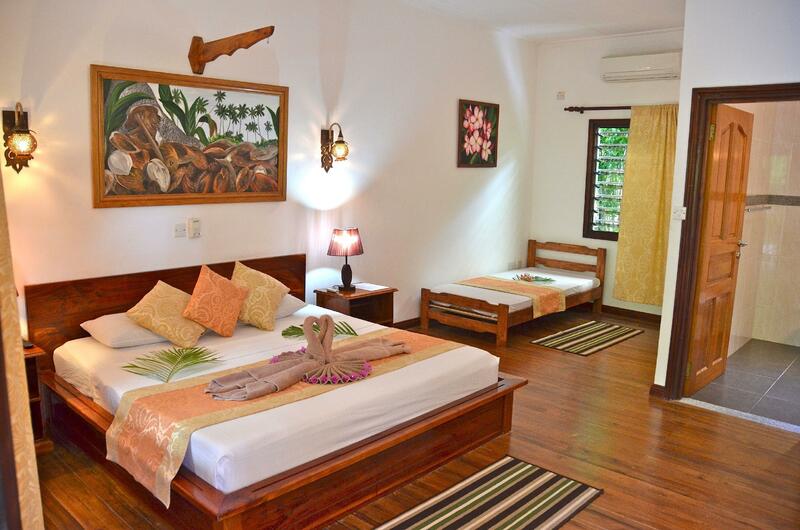 The rooms are set in a garden, providing a lot of privacy and relaxation. Very well kept, exceptionally cleaned on a daily basis. Wonderful and responsive hosts, helped us with every request for dinner etc. We had a great time and would highly recommend it! Great place to stay. Very spacious accommodation. They cleaned the rooms very well. The staff was friendly & very helpful. Geckos and birds keep visiting you so if you don't want them inside, keep your doors closed. The kitchen has all the basic stuff you'd need like utensils, salt etc. Buy your own oil though. They give you a welcome drink and fruits on arrival. Always keep a flashlight handy. If you come back after dark, you won't even be able to see your keyhole without the flashlight. 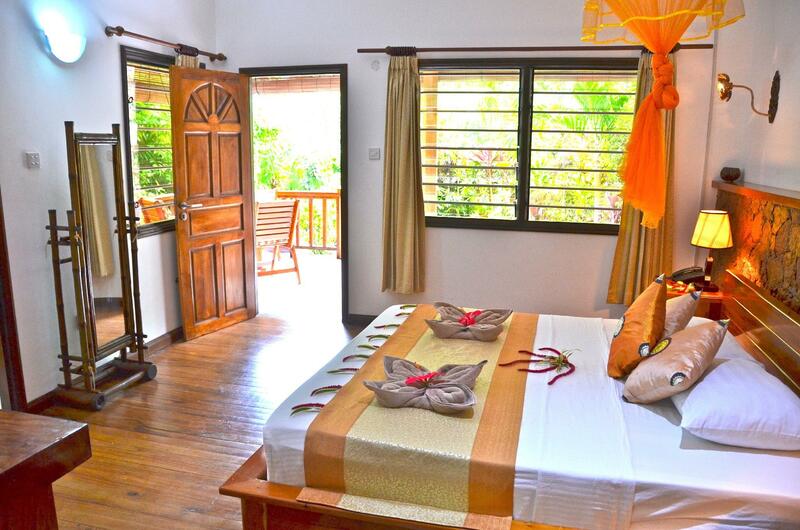 I wouldn't hesitate in staying here again if I revisit La Digue. We had a very good experience at Cocotier Du Rocher. The owners are outstanding nice and helpful. They organized some bikes for us which ich very recommended since its quite a walk in the heat to get to the beach. Overall very good experience! The staff were very friendly and helpful. The gardens were lovely, the staff gave us some star fruit one morning from their tree. The location was s hot cycle ride down to the main street. We really enjoyed our stay at the Cocotier Du Rocher. The self catering apartment had all we needed and was in close proximity to shops for food and drink. Stephan and the staff were very helpful and arranged our excursions for us. I would recommend this self catering apartment. It was good value for money and had everything we needed. My entire family absolutely loved this place. Of all of the places we stayed while in the Seychelles for nearly 1 month, including at 5 star resorts, THIS is the ONE I would return to in a heart beat. I was not ready to leave after our 5 night stay. I loved the garden setting, wonderful variety of plant and bird life, and the granite rocks. The room itself is spacious, spotlessly clean, and the attached kitchen was very well stocked. 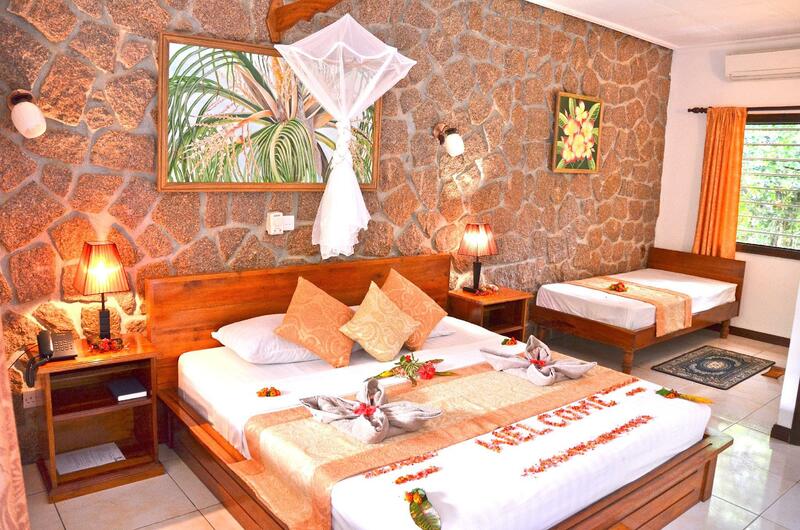 The staff and Seychellois owners are friendly, extremely knowledgeable about La Digue, and helpful. The location is just slightly uphill from the main tourist area, and it is really, really nice to be off the beaten path - especially if you want to experience nature instead of the beach - you should, at least for part of your Seychelles stay. 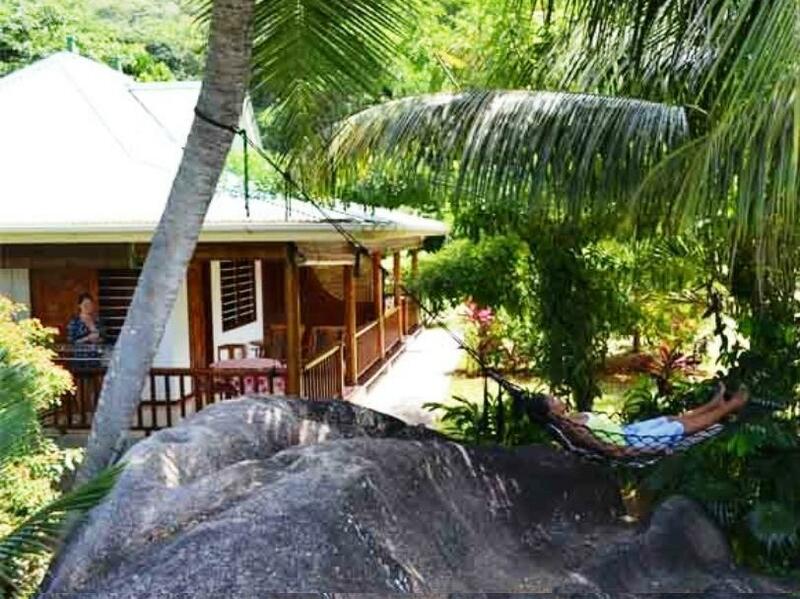 La Digue is the place to 'get away from it all' and this spot is the place in La Digue. Convenience stores are located close by, and you can rent bicycles through the hotel at $10 a day. A deal! Everything on La Digue is close by. We had no problem riding the roads with our 6 year old. The best spot on La Digue to see the paradise flycatcher is right down the road, less than 5 mins. by bike. Do not miss the chance to have Stephan's mom cook you dinner - it was the BEST octopus curry and served with local ingredients grown right in the garden. Have the breakfast every morning. They will prepare it for you including fresh squeezed tropical juices, eggs prepared differently every time (and delicious!) toast, milk, coffee. It was perfect. I am one to always find a nit to pick and try as I may, I cannot find anything wrong with this place. It is a true gem, and the price is too low for what you get. Be prepared for the occasional power out.. or internet slow/unavailable at times. You are on a tiny island in the middle of the ocean miles from nowhere - these things happen. Roll with it. Enjoy the no TV, no phones escape. It is worth it. We had a great stay at Cocotier Du Rochier.. Stephan is really service minded, and helped us out with any question we had.. The chalets are perfect for a couple, with plenty of privacy the way they have made the garden.. I think they could offer free pickup in their buggy from the jetty as it is a bit if a walk. Other than that, you'll have a very nice time Thanks!! 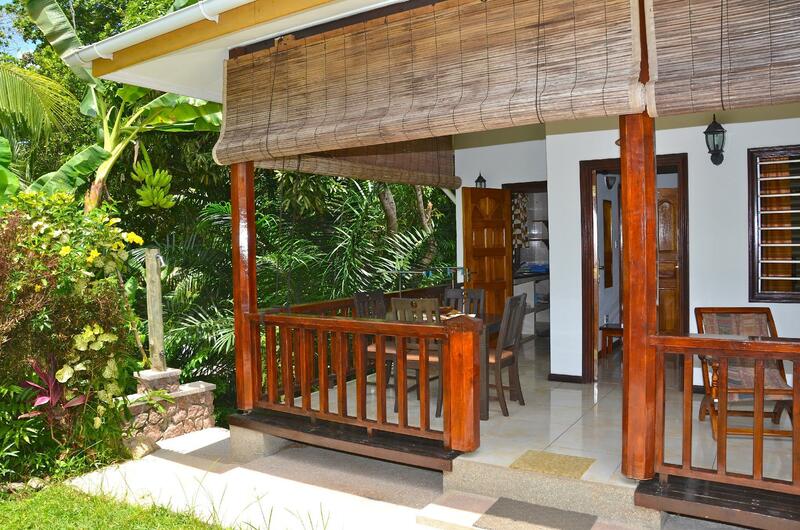 Cocotier is really good for what it is offering, basic yet comfortable self catering apartments. Stefan was very friendly and helpful, our room was clean and comfortable. Stefan indicated that apartments are walking distance from ferry which is NOT the case so caused a bit of frustration on our arrival after a long and tiring travel day. Location is central enough, cocotier felt a bit like a camping experience, you could hear neighbours' kids shouting and playing from early morning, gardeners sweeping outside from 7 in morning, our room was right next to a local shop/resturant so music and locals partying at night. But for price a good stay, we probably just had a challenge with La Digue in general, was really hot and you have to cycle everywhere, closest nice beach is at least 25 min cycle away over hills, restaurants and supermarkets are really hit&miss, we actually struggled to get a decent meal in island until our last night, you really do get exposed to the art of living on such a remote island with its locals. Beneficial as you do really unplug from outside world but we ended our 5 night stay actually feeling quite tired and ready for a good bed and meal. But grande anse, petit anse and anse coco beaches made the effort worthwhile. 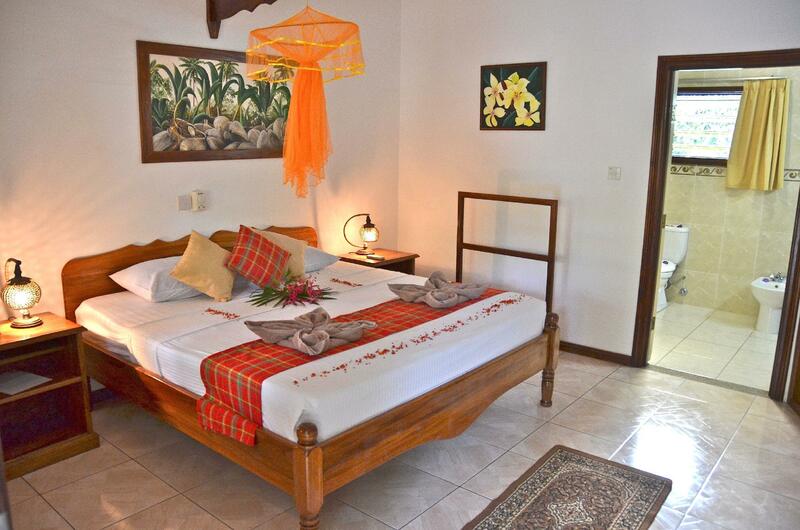 Would still recommend cocotier as great place to stay in la digue - as it is very well priced, great service and comfortable. 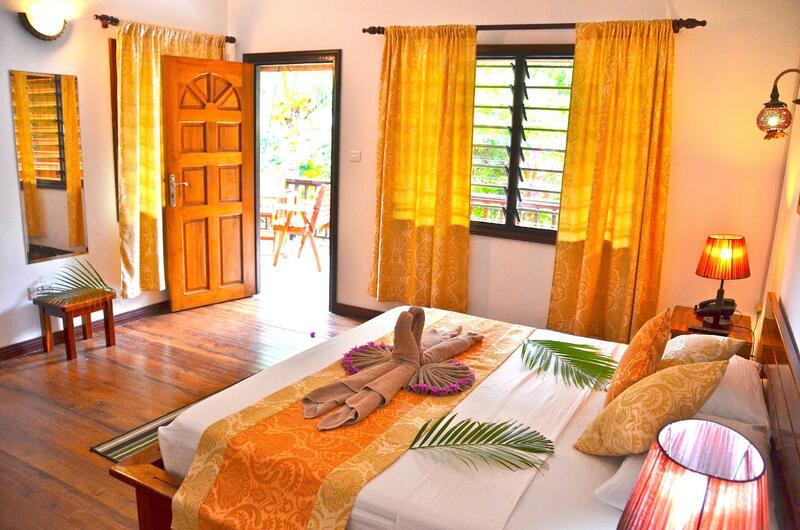 The bungalows are very comfortable and clean and placed in a wonderful tropical garden. 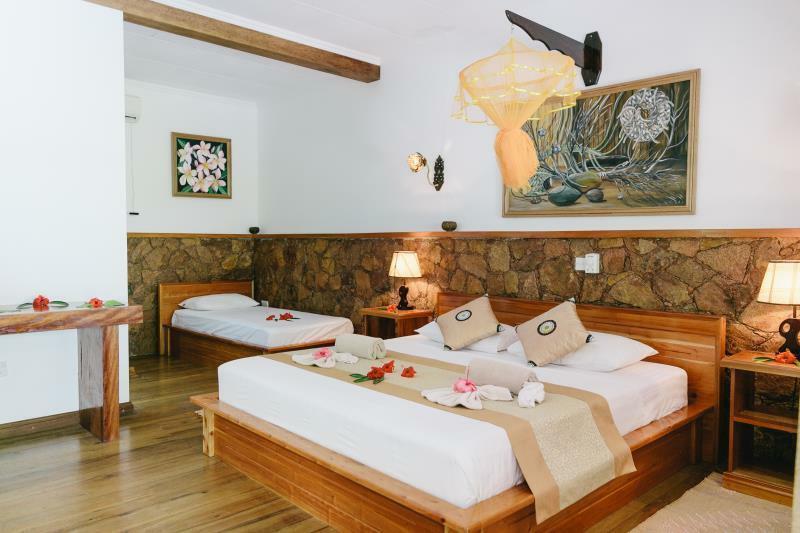 We had a perfect stay in this guesthouse! Cocotier du Rocher's accommodations are pretty simple, but it's a great place for the money. Highlights include the super nice staff and the great garden. A happy and relaxing self catering place , We enjoyed our time very much.